Send the Marshall High School Band to the 2019 Pearl Harbor Memorial Parade! 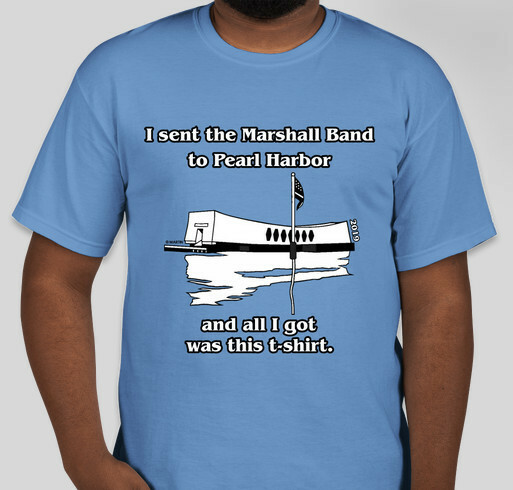 Purchase shirts/donate funds and send the Marshall band to represent the Commonwealth of Virginia in the Pearl Harbor Memorial Parade. Through our music, we will honor the Pearl Harbor survivors, veterans, active duty military, and their families. All funds raised will go directly to George C Marshall Band Parents Organization of George C Marshall . The George C Marshall Band Parents Organization is an IRS 501 (c) (3) non-profit organization. EIN 54-1470430. Your donation, less $25 for the t-shirt cost, is tax-deductible. You have the option of saving on shipping cost and picking up your order at our ViVa! Vienna! Booth on Saturday, May 25, and Sunday, May 26, or have the order mailed to you for a small shipping charge. Shirts are available in form-fitting women and unisex (adult and youth) sizes. It is best to check the sizing chart to get the best fitting shirt. Please consider adding a cash donation to your t-shirt order. You may also donate funds without purchasing a t-shirt. Before completing your order, you may choose to (1) have your name and donation amount posted on the site, (2) have your name but not the donation amount posted on the site or (3) remain anonymous. I was in this band from 2009-2013, good luck Marching Statesmen!!!! Love you!! Have a great time Brent. because Brent is a cool dude, and how cool to play at Pearl Harbor! Share Why You Support "Send the Marshall High School Band to the 2019 Pearl Harbor Memorial Parade!"